Looking for financing for modular construction or home loans for manufactured homes? FHA and USDA allow financing for manufactured home – permanent foundation. Loans for manufactured home and land have requirements such as an engineer’s certification for manufactured homes. Financing is available for the lot purchase, permanent mortgage, and construction with one closing. This allows you to avoid incurring additional costs for a second appraisal and closing costs for a permanent loan because of the nature of one closing. There is no need for re-qualification because the loan closes prior to construction beginning. The process is streamlined by working with a team that is experienced. Ineligible construction types include single-wide manufactured homes and non-traditional construction types. One closing reduces total costs. You do not have to make mortgage payments during the construction phase. Rate is locked prior to closing and construction. Do not have to re-qualify for the loan after the construction is complete. Fast turn times because of the nature of the loan. FHA and USDA financing require a manufactured home to have a permanent foundation that is complaint with all guidelines. The foundation must be permanent, engineered for safety, and long term satisfactory performance. You may be wondering what a manufactured home – permanent foundation is. They are constructed of materials like concrete or other durable materials that are site-built. There are attachment points to an anchor that stabilizes the manufactured home. A licensed professional engineer is required to be designed or developed structurally in accordance to permanent foundation guidelines. 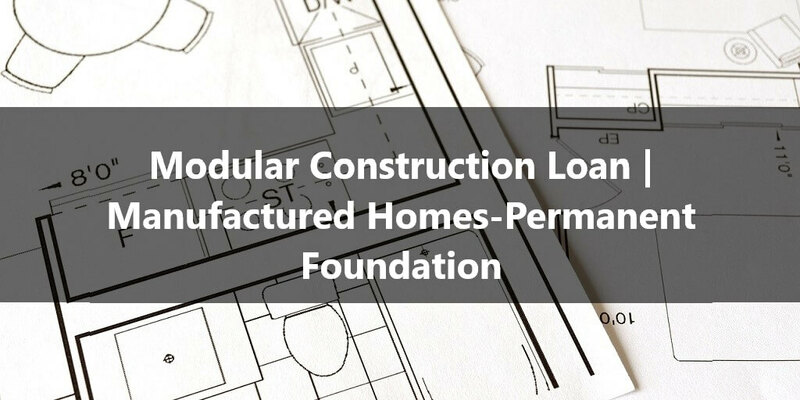 There is a permanent foundation guide that a licensed professional engineer follows when certifying the manufactured and modular home. Loan amount up to FHA county mortgage limits and USDA area loan limits. Minimum down payment requirement for FHA is 3.5% and no down payment required for USDA. Minimum of 620 FICO credit score, but other traditional loan programs are available with lower credit scores. Debt-to-income ratios are determined during the pre-approval process by running the Automated Underwriting System (AUS). Land can be purchased, gifted following agency guidelines, or owned. Nicholas Auriemma is a Loan Originator at Nationwide Mortgage & Realty, LLC, providing information on mortgages that can often be confusing even to real estate and mortgage professionals. Borrowers can be discouraged because mortgage professionals can be mistaken due to guidelines always changing, the extent of guidelines, their company having an overlay (a stricter guideline), or other lenders not offering a loan program. Call or text Nick anytime at 630-779-8430 or email at nick@nationwidemtg.net. Start by applying to get pre-approved today. Company NMLS Unique Identifier #276777.